Getting a license and finally being able to drive is a very exciting time for teenagers. While teens may be ready to jump behind the wheel and hit the road, parents should discuss safe driving techniques with their children to ensure they keep themselves and others safe on the roadways. Unfortunately, teens' inexperience makes them the highest group for auto accidents. However, practicing safe driving techniques can reduce that risk. To promote safe driving for teens, the National Highway Traffic Safety Administration sponsors Teen Driver Safety Week annually in October. This year, the event falls October 16 to 22. In honor of the upcoming Teen Driver Safety Week, here are some ways you can ensure the safety of your teen driver. Most teens drive used cars in New Jersey. When buying used, always be sure to get the vehicle history report. Whether you're buying new or used, pick a safe car equipped with the latest safety features, including anti-lock brakes, airbags, traction control, and electronic stability control, as well as an outstanding crash safety rating. While you want a car that provides protection in the event of a crash, it's best to avoid large, bulky cars like trucks that aren't the easiest for new drivers to operate. For a safe car for your teen, visit our Autoland Dealership on Route 22 in Springfield. We carry a variety of new and used cars in New Jersey and will be happy to assist you with your search. A seat belt provides protection in the event of a crash. Not wearing a sea tbelt significantly increases the risk of injury or even death. Make sure your child knows to always wear a seat belt and to check that their passenger is buckled up before hitting the road. Newer cars have a seat belt warning that beeps until everyone is wearing a seat belt. Speed limits are set for a reason; the speed limit is based on the road condition and surrounding area. Speeding significantly raises the risk of an accident, as it impedes your ability to stop or react quickly. Aside from accidents, speeding can also result in a traffic ticket, resulting in fines, points, and a higher auto insurance premium. Encourage your teen to maintain a safe speed and safe distance with the car in front of them. Also tell them not to feel pressured to speed to keep up with traffic. Cell phone use while driving is among the leading causes of auto accidents. 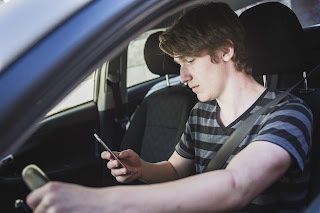 Today's teens are more tech savvy than ever, and it's important your child understands the extreme danger of texting and using a phone behind the wheel. Research shows texting takes your focus off the road for about 5 seconds, which is the equivalent of driving the length of a full football field while blindfolded. Encourage your child to leave their phone in their bag or safely stowed in the glove compartment or center console when behind the wheel. Drivers should also turn off their phone or put it silent to avoid the urge to answer. Even texting while sitting at a stop light should not be done. Drivers still need to pay attention while stopped in case something occurs. In addition to cell phones, there are other distractions that should be avoided while driving. A distraction is anything that takes a driver's mind off of driving, hands of the wheel, or eyes off the road. Talking to passengers, adjusting the temperature controls, changing the radio station, and eating and drinking are all distractions while driving. While these are distractions for anyone, they are even more so for inexperienced drivers; distractions can prevent a teen driver from noticing an impeding danger until it's too late. To avoid distractions, prohibit your teen driver from having more than one passenger in the car, as passengers increase the risk of an accident. Also encourage your teen not to eat or drink while driving, as well as to keep other distractions to a minimum. To equip your teen with more experience and give yourself piece of mind, enroll them in a safe driving program. Safe driving courses can be taken in-person or online and typically last between six and 12 hours. Your insurance company may offer a driving safety program, or check with the New Jersey Department of Motor Vehicles for a list of approved courses. Not only will the program increase your teen's knowledge and skills, but also it could result in a discount on their auto insurance. If you don't practice what you preach, it can be difficult for your teen to follow your advice. Make sure you are obeying the same safe driving practices that you are teaching your child. Make sure you are always wearing a seat belt, avoiding distractions, maintaining a safe speed, and so on. You have shared very useful tips for safe driving. Last month, enrolled my daughter to a Port Macquarie Driving School which has very good teachers. They taught her great skills and surprisingly, she cleared driving test in her first attempt itself.